I stood there in awe. Jaw open and admittedly I was drooling as the garage doors rolled up and the F12 Berniletta’s rear end greets me. I circled the car numerous times taking in every inch of the car. Angelo gets in the driver seat, turns the key and she fires to life, which can only be described as the roar of an angry freakin tiger! And sends shivers down my spine. The car is already prepped thanks to his trusty Auto Detailer, Naeem Karim from Absolu Car Care, so we get to work on moving the car around and shooting from all angles. I could have snapped away with a freaking 3310 and the pics would still be Gas Magazine feature worthy. After a small chat and some refreshments Angelo suggest we take a “short” ride, half a tank, but hey who’s complaining. 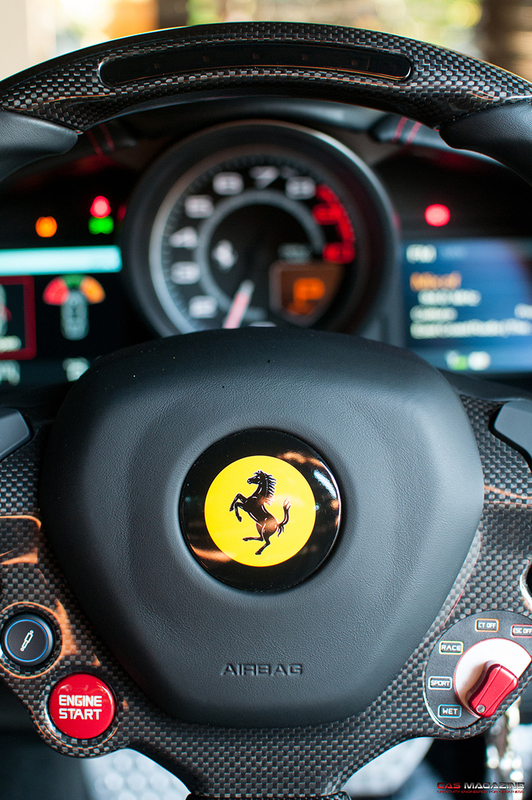 Ferrari, though a breed of sports cars that you wouldn’t typically associate with comfort, has not compromised one bit with this grand touring coupe. Snug as a bug and with a big fat grin across my pip we set off through the speedbump infested estate without a hassle. The interior is classy and sporty, and although I was wearing my very best Supergas they felt like $5000.00 Armani. Angelo went about explaining each of the buttons and their functions with great enthusiasm and with hint of pride in his voice, obviously a true Ferrari Fan. I mean the man has a freaking customized Ferrari Golf cart capable of speeds higher than some rice buckets on backstretch.. Maybe its fitted with VR6 injectors, or even a Flux Capacitor… ahh screw it, going off topic again. Back to the cockpit. 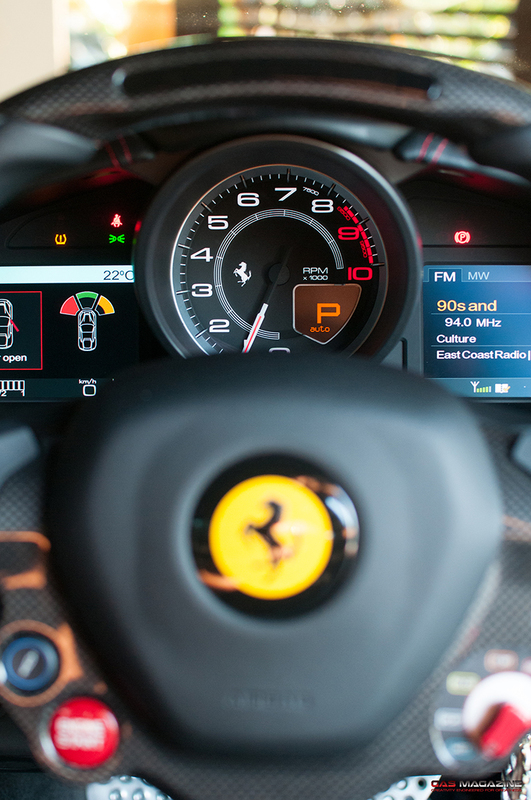 Ferrari has made controlling the F12 a breeze, with everything you need at your finger tips. A flip of the Manettino Dials and you can instantly feel the chassis adapt to the new selection. RACE mode was the choice of the day, obviously! We hit the N2 and before we know it we are cruising at 2xxkm/h. 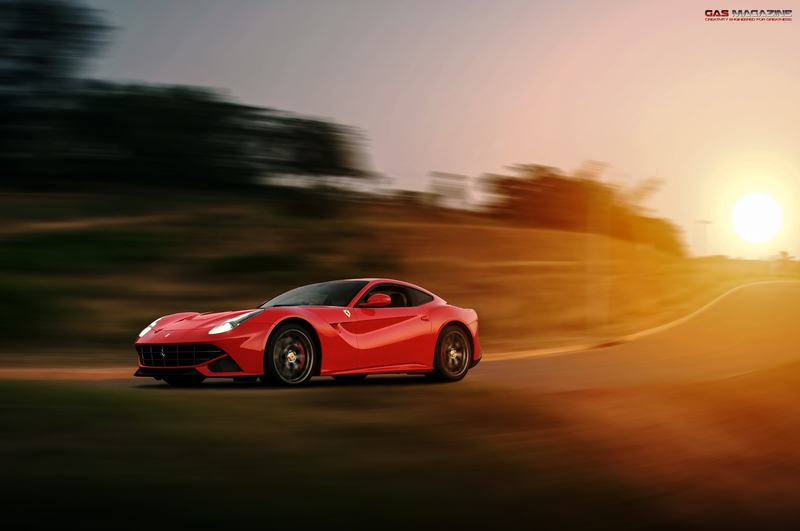 The F12 is capable of reaching the 200 mark in around 8 seconds and if that is not impressive enough its 0-100 is a mere 3.1s. The G force experienced is close to that of an F1 car and to the unsuspecting passenger your neck may very well resemble a cooked piece of spaghetti flopping around in vein while trying not to scream like a little girl. The F12 is a front-mid mounted naturally aspirated 6.3l V12 producing a massive 730hp at 8250rpm and 690nm of torque at 6000rpm. Its power is grounded through a 7 speed dual clutch semi automatic transmission with shortened gear ratios to match the power of the engine and its third generation CCM3 Ceramic Disc brakes bring the prancing pony to a standstill from 200km/h in just 75m. 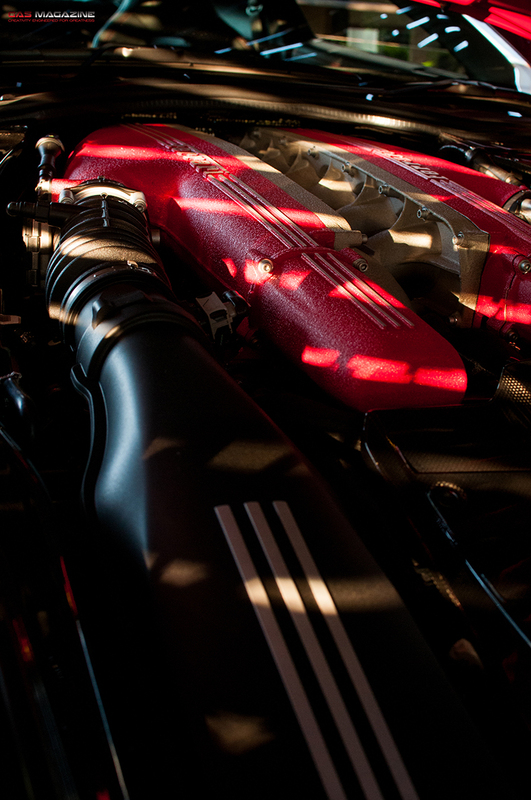 The symphony from its twin pipes really comes alive from 3000rpm and gears change in a millisecond. It has the most glorious and menacing sound and is easily compared to a F1 spiriting though its gears. It demands presence on the road as every vehicle ahead of us pulls over to the left, whilst taking out their camera phones and then eagerly trying to keep pace along side us snapping away at its elegant lines. The look on little kids faces are priceless as their noggins are pressed so hard up against the window while pointing uncontrollably. That’s the thing about this motoring legend. They bring out the passion in all of us, the enthusiasm of a kid and overwhelming joy. Something that for some reason other car manufacturers just have not got right. I mean, lets see if you would get an equal response from a Porsche 911, chances are you would be lucky for the car to even more out the way! Once the 20in tyres warmed up to an acceptable 55deg, Angelo really took it through its paces. He is an extremely good driver and although I am normally sketchy when I am the passenger, I felt rather comfortable taking the corners at a inch shy of 300. 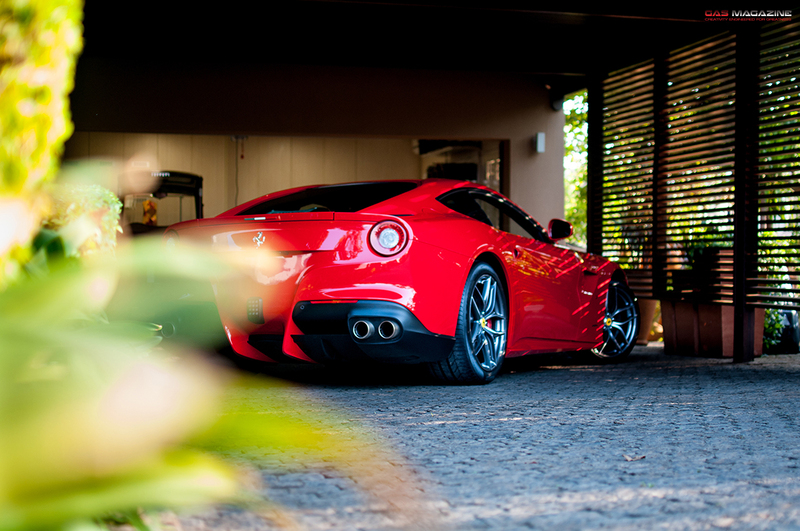 The F12 makes use of clever aerodynamics developed through the 599xx and Formula One programmes. The “aero bridge” is a feature to mention. The Aero Bridge is a air tunnel running over the bonnet, through the flanks above the wheels and down along the sides of the car, effectively producing 123kg of downforce at 200km/h with a drag co-efficient of 0.299. Half a tank later and a foot or two away from Richards Bay, we did a u-turn and light up its rear tyres all the way back to Ballito. The sun started to fall rapidly and we rushed to get the last few pics as the sun was settling and obviously to replace the tank of fuel we just used. Sadly it was time for me to start heading for the hills. Shook hands with Angelo had one last glance at the F12 over my shoulder and set off home in my little VW Polo! Special thanks must go out to Angelo himself for giving me the opportunity to shoot the F12. Something not many automotive togs will get the chance to do. With all his (obvious) wealth he is still one of the most humble guys I’ve met and a real stand up guy!